It is one of the oldest and yet the most modern natural materials in everyday use. Not least, thanks to modern chemistry, leather is a successful product on a global level that is constantly being reinvented. 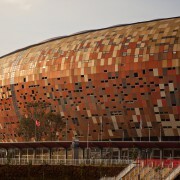 Above all, however, it is a prime example of sustainability. The Egyptians were already familiar with how to make it, as tomb inscriptions from thousands of years ago show. The 5,300-year-old iceman known as “Ötzi” was wearing clothing made from several different varieties. Owners of luxury cars swear by it. What’s more, it is impossible to imagine fashion stores without it. Of course, we’re talking about leather. It is one of the oldest, most durable, and still one of the most versatile natural materials in everyday use. Now, thanks to modern chemistry, its best properties can be preserved with an increasing eye to environmental protection and sustainability. These properties are in many respects still unbeatable. Leather is robust and durable. With proper care, leather articles last for decades. There are very few materials that gain charm and attractiveness over time like leather. Leather breathes actively, allowing air and water vapor to circulate – in the clothing industry this is an immensely important advantage over synthetic materials. At the same time, it can be made water-repellent, while, on the other hand, damp leather which has absorbed up to 20 percent water does not feel uncomfortably wet. Leather is elastic, even after years of intense wear. 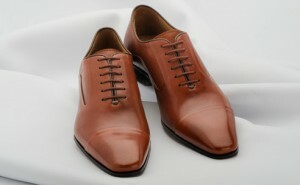 Leather shoes fit to the foot and to a certain extent grow with it. Leather insulates, warms, and yet does not cause us to sweat like many synthetic fibers. 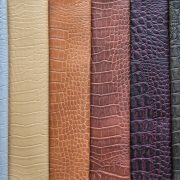 “We mustn’t forget: these properties were developed by the skin over hundreds of thousands of years of evolution,” explains Dietrich Tegtmeyer, Head of the Product Development & Application Division in the Business Unit Leather at LANXESS. “Preserving them is the master art of leather craftsmanship.” Respect for the material and craft resonates throughout the work of Tegtmeyer and his colleagues. Making leather from animal hides requires a number of steps. Perhaps the most important of these is tanning. Once the hair, flesh, and uppermost layer of skin have first been removed from the hides, tanning agents are used to ensure that the hide is durable and supple. Tanning agents stabilize the collagen matrix of the skin to prevent the hide from shriveling and hardening as it dries. At the heart of the hide are spiral-shaped protein chains which would normally tighten like rubber bands as the hide dried. Tanning ensures that they stay long and fixed but supple. To a certain extent they act as spacers within the tissue. Only after this step can the hides be passed on for further processing, still moist and uncooled. Hides tanned with chromium have a blue shimmer and are therefore also called “wet blue” at this stage of the process. Similarly, white organically tanned hides are called “wet white.” These pre-tanned hides are the basis for every subsequent form of leather. They get their final color and characteristics during post-tanning, when dyes and oiling agents are also used. 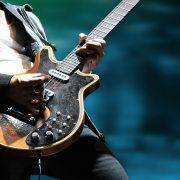 The subsequent finishing process deals exclusively with the surface of the leather. This is where the outer layer gets its structure, water-repellent qualities and dirt or UV resistance. 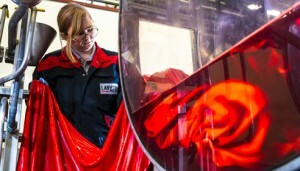 This can be achieved using oils or sheer polymer coatings – it all depends on what the customer requires. “Leather production is still a real craft, even today,” says Tegtmeyer. “After all, we are dealing with a natural product. As is the case in winegrowing, the raw materials are never completely standardized. It takes a lot of knowhow to ensure that, despite this, a premium product is always produced.” Since the beginnings of the leather industry, which suffered from a bad image for centuries due to the foul-smelling tanneries, a lot has been accomplished. Increasingly refined processes and, above all, synthetic tanning and finishing agents have revolutionized the craft. Chrome tanning deserves special mention, as it is especially effective, inexpensive, and time-efficient. Thus, since its development in the mid-nineteenth century, the use of chromium has become the dominant process worldwide. Approximately 80 percent of all leathers are made in this way. Chromosal® – a LANXESS bestseller from Leverkusen – is thus also one of the oldest products made by the specialty chemicals group. It is used to make leathers that will not shrivel even if they are boiled. 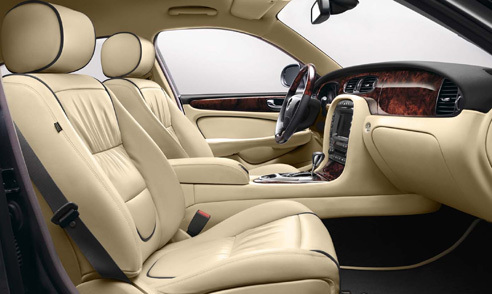 However, Chromosal® is only one of about 500 products which LANXESS stocks for leather production. The Group is not only one of the top 5 manufacturers of leather chemicals worldwide. LANXESS is also one of a very few full-range providers offering and developing appropriate solutions for every step of the leather production process. Even though leather production is a business which is thousands of years old, the potential for innovation is far from exhausted. This is why the Group maintains applied technology facilities not only at its headquarters in Leverkusen but also in all major leather markets worldwide, where leather experts from LANXESS focus on new solutions and products. Leather is a product which is strongly dependent on fashions and trends. Twice a year, designers and producers sketch out the fashion trends for the summer and winter collections 18 months ahead. When it comes to the leather industry, it is the designers in Italy who still set the tone – often in the truest sense of the word. What colors, styles, and finishes will be on catwalks and shelves the season after next depends largely on the ideas of the leather designers. Thus, LANXESS is once again working this spring with its own designer and a team of leather technicians in Italy on implementing new trends for winter 2015/2016. Leather producers will choose their favorites from these, be it shoes, accessories or car interiors – another growing market. •for example, chromium comes from South Africa, the world’s largest chromium producer. 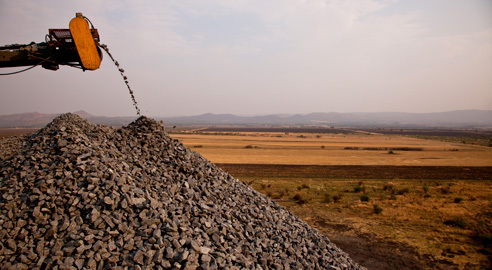 LANXESS operates its own mine there. •The hides come primarily from Brazil or North America, the largest beef producers in the world. 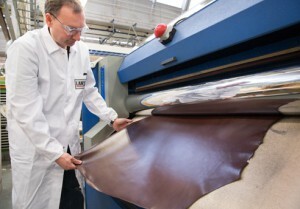 •Europe continues to lead as the trendsetter and leather chemistry provider. •Most of the processing now takes place in China. •Leather is purchased and used worldwide. 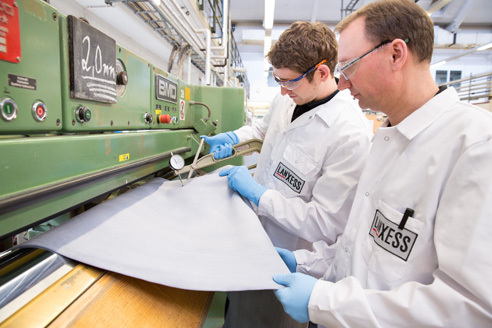 As one of the five top suppliers and one of the few full-range providers, LANXESS is benefiting increasingly from the growing drive for efficiency in the leather market. For example, with its chemicals the Group is making it possible to produce high-quality leathers even from less perfect hides. Thus, a larger portion of each animal hide can be used, which in turns saves resources. Nowadays, around 50 percent of an animal hide is processed into leather. However, other constituents from the hide are being used increasingly, including collagens, proteins, and fats. 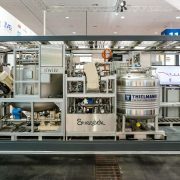 They can be used for applications such as fertilizers or starting materials in the cosmetics industry. In all, about 99 percent of the animal hide – which is after all a byproduct of our eating habits – can be utilized. The ancient Egyptians and “Ötzi” would have remained unmoved by this. However, for the LANXESS specialty chemicals Group, which is grappling intensively with the environmental consequences of a rapidly growing global population, it is one of the many examples of a philosophy of committed sustainability.